Cape Town is fast approaching its Day Zero, when residential taps will run dry. The water shortage doesnâ€™t just affect its residents – it has a knock-on effect on agriculture, jobs and the economy. However, the drought is but a symptom of the greater problem of climate change. Day Zero is when the dams will drop below 13.5% capacity, taps will be turned off and Capetonians will have to collect water at one of 200 checkpoints around the city, monitored by police and the military. Based on current consumption, the city will reach Day Zero on 12 April with the cityâ€™s feeder dams sitting at just 27.2% of capacity. Basically, there are 80 days till the taps run dry at the current levels of water consumption. The water crisis is steeped in misinformation. On 9 January The Daily Vox published a now-removed* piece about a video made by vlogger Adam Spires and actor Siv Ngesi which highlighted the urgency of the drought and the Global Food Report’s alarming food versus water statistics. The video explored the angle of the produce we consume and how much water it uses. As many pointed out, the video was inaccurate because it made reference to goods that are not grown in South Africa such as coffee and chocolate. The video has been shared over 23 000 times on Facebook. The Daily Vox spoke with Spires about his motivation to make the video. â€œThe purpose of the vlog was to open up dialogue, to pose a question that I donâ€™t necessarily know the answer to: at what point do the taps in the home become more of a priority than the farms?â€ Spires said. â€œThe answer is not for farms to get no water – thatâ€™s a country crippling solution,â€ he said. The drought dealt a great blow to agriculture and to farmers. Western Cape is not the only South African province facing a drought. Last year, at least two farmers in the Eastern and Northern Cape committed suicide. â€œWater shortages is seriously impacting on agriculture,â€ water and drought specialist at the Western Cape Department of Agriculture, Andre Roux said to The Daily Vox. 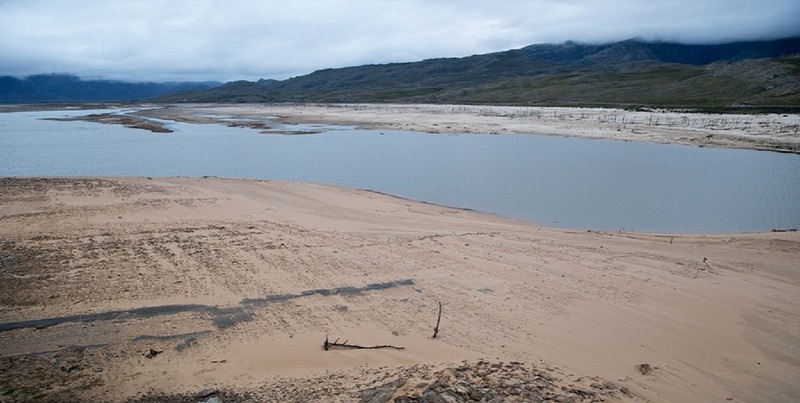 Drought-imposed restrictions in the Western Cape vary from 50% to 83% across the province while the Klein Karoo area has a 100% restriction, he said. The Western Cape grows a wide range of crops of fruit like wine and table grapes, citrus, and berries, vegetables and pastures for dairy farming under irrigation and wheat, barley and canola under dry land. â€œ[The drought-imposed restrictions] seriously impacts on the fruit and grapes crops with much lower production this year. Some orchards and vineyards have been removed as the farmers do not have water to irrigate them,â€ Roux said. Many hectares of vegetables could not be planted due to a lack of water, he added. This also has an impact on seasonal agriculture workers and Roux said it is estimated that approximately 50 000 workers will have no income or a drastically reduced income this season, which in itself creates a socio-economic crises. â€œDry land crops were also severely affected during the 2017 winter, with some farmers managing to recover only their input costs whilst others experienced 100% crop failure,â€ Roux said. Stock farmers (farmers that farm livestock) do not have food for the animal to eat. Their own land does not provide grazing, and they cannot buy fodder as it is not available in the province and very expensive to transport in from as far a Mpumalanga, he said. Roux said when there is no drought, the unrestricted volume of water allocated from the Western Cape Water Supply System (WCWSS) is 100 million m3 for agriculture and 400 million m3 for urban use per annum. The rest of the agricultural allocations varies from region to region. The allocation of water to both the city and agriculture from the WCWSS is done through a model that is run at the beginning of November each year. The model was developed to calculate the allocations that can be made to ensure that the system does not fail in the next two seasons, taking into account certain parameters like the percentage of water storage in the six big dams that provide water to the system taken at 1 November and the rainfall and evaporation expected. Currently the urban allocations from the WCWSS is restricted by 45% and agricultural water by 60%. Roux said irrigation farmers are already effectively using the limited water resources by using micro or drip irrigation systems and the most up to date computer technology. Farmers also monitor the soil moisture to determine when it is necessary to irrigate their crops. Siyabulela Manona, land tenure policy and implementation expert at the non-profit organisation Phuhlisani, said we must not look at the drought in isolation. â€œThis is not a drought issue, drought is one episode in a bigger scheme of global warming impact,â€ Manona said to The Daily Vox. Manona said the problem we are faced with is understand our vulnerability as a society to climate change and adapting to them. Manona lives in the the Eastern Cape and has worked in its rural areas for the past. He said to The Daily Vox that for the past 15-20 years he has seen municipalities delivering water to communities in trucks. He knows what the reality of Day Zero looks like. Western Cape premier Helen Zille penned a column in the Daily MaverickÂ on 22 January about the logistics surrounding Day Zero and the mismanagement of the water. Zille focused narrowly on the effects of the drought in the Western Cape, and didnâ€™t look at the greater picture of climate change. The problem lies with policy-making and implementation, Manona said. â€œOur politicians are driven by five-year horizons instead of saying if youâ€™re dealing with global warming you have to think long term,â€ he said. Manona said policy makers need to sit down with farmers to discuss the problems of climate change. He said using high-tech methods of irrigation, with high levels of water, is no longer an option. Instead, we needed to have developed adaptation plans that involved changing irrigation methods or switching to crops that use less water. â€œWe need plans to assist farmers to adapt to climate change,â€ Manona said, â€œif you narrow your view to drought, you are closing your eyes to other problems.â€ And that is not limited to the drought but should extend toward things like damaging heavy rains and excessive wind that causes veld fires. Manona said all three levels of government should be drafting and implementing laws for climate change adaptation and a response plan suitable to their environment. Drought is a symptom of climate change, Manona said. We need to change our agricultural habits to suit climate change. The Daily Vox has reached out to the Department of Rural Development and Land Reform for comment and will update this article should it be received. *Editorâ€™s note: In the interest of providing accurate information at a time of great crisis in Cape Town and the Western Cape, the piece has been removed from the site.